“Vastu-shastra” (ancient architural science of India, has been written in many places from ancient times. In western India, a treatise called “Vriksharnava Shastra ” describes the , which is unique only to Jain architecture. This basic form of Jain temple is “Four faced open form’ in which the central shrines of these temples are opened to four directions, and in front of each side, there is a “mandapa” (hall which represent a place of both worship and teaching). “Chaumukh” or ” Chaturmukha” (four faced) image – four statues of Tirthankaras are often combined back to back with each other, in either standing or sitting posture. This is the original style of Jain temple construction (Jaina chaturmukha image of the 3rd century has been excavated in Mathura). Although many Jaina temples followed the mainstream style of Hindu temples [1 main deity in the inner sanctum garbhagriha + mandapa], from the medieval period, the Jains gradually developed their original “Four faced open form” in the temple design. 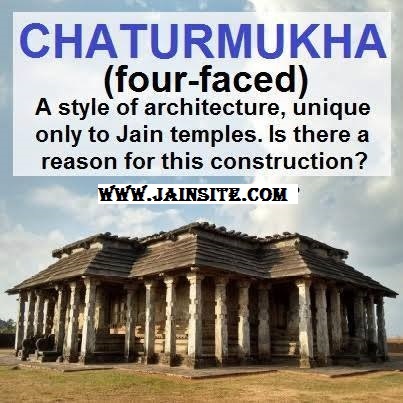 Why was it especially Jainas who developed chaturmukha (four faced open) type shrines? The answer is to do with Jaina way of worship. There is no GOD (generator, operator, destroyer) according to Jaina philosophy. The worshipped are Jinas who have attained Moksha and they are adored in the hope to emulate from their teachings and path. Following this logic, a Jaina temple is not a house of God as are the Hindu temples (thus meals and oil lamps are served to a statue of God during daytime and the door is closed at night in order for God to sleep). Rather Jaina temples are a place where a “Tirthankara” (Jina) gives teachings. It is called “Samavasarana,” and the doctrine of Jina should be preached in all directions which is the main reason and theory for Jain temples to be built in the Chaturmukha style.